Allografts have recently become increasingly popular for anterior cruciate ligament reconstruction (ACLR) in the United States even though many studies have shown high allograft failure rates (Gorschewsky et al. in Am J Sports Med 33:1202, 2005; Pritchard et al. in Am J Sports Med 23:593, 2005; Roberts et al. in Am J Sports Med 19:35, 2006) and no meta-analysis or systematic review of allograft clinical stability rates in comparison to autog rafts has previously been performed. We hypothesized that allografts would demonstrate overall lower objective stability rates compared to autografts. To test this hypothesis we performed a meta-analysis of autograft and allograft stability data. A pubmed literature search of all allograft series in humans published in English was performed. Articles were then bibliographically cross-referenced to identify additional studies. Series inclusion criteria were arthrometric follow-up data using at least 30 lb or maximum manual force, stratified presentation of stability data and minimum two-year follow-up. Twenty allograft series were thus selected and compared to a previously published data set of all BPTB and Hamstring (HS) autograft ACLR series using the same study inclusion criteria and analytic and statistical methodology. IKDC standards of 0–2 mm (normal) and >5 mm (abnormal) side-to-side differences were adopted to compare studies. Normal stability for all autografts was 72 versus 59% for all allografts (P < 0.01). Abnormal stability was 5% for all autografts versus 14% for all allografts (P < 0.01). Bone-patellar-tendon-bone (BPTB) autograft normal stability was 66% versus 57% for BPTB allografts (P < 0.01). Abnormal BPTB autograft stability was 6 versus 16% for BPTB allograft. Hamstring autograft normal or abnormal stability rates were 77% and 4% and were compared to soft tissue allografts as a group which were 64% and 12% (P < 0.01). This is the first meta-analysis comparing autograft to allograft stability in ACLR. Allografts had significantly lower normal stability rates than autografts. The allograft abnormal stability rate, which usually represents graft failure, was significantly higher than that of autografts: nearly three times greater. 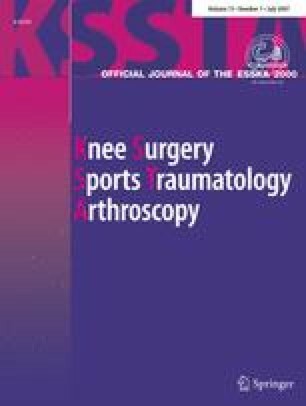 It would therefore appear that autografts are the graft of choice for routine ACLR with allografts better reserved for multiple ligament-injured knees where extra tissue may be required.